The World Medical Innovation Forum was held over the past three days at the Westin Copley Place in Boston, attracting more than 1,000 attendees and featuring world-renowned experts on brain and nerve disorders. Dr. Mallika Marshall had the honor of moderating a panel on multiple sclerosis Wednesday morning and learned about all of the remarkable advances in treating this disorder that attacks nerves in the brain, the eyes, and the spinal cord and affects more women than men. Today, Nicole struggles with her vision and strength in her legs and worries her two young daughters will grow up to resent her limitations. 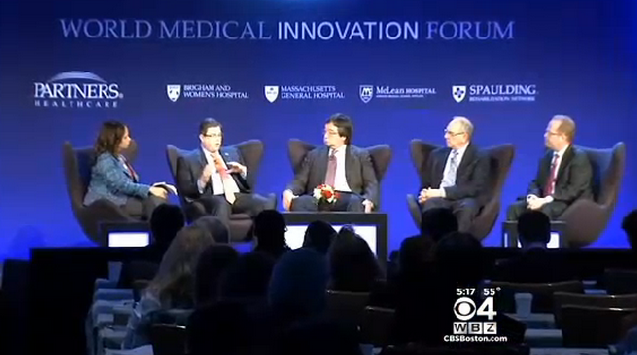 The panel on Multiple Sclerosis this morning discussed a variety of new therapies that are on the horizon. New drugs, a high-tech watch that can monitor patients at home, mini-MRIs to look at a patient’s brain in a clinic room during a routine check-up, and possibly ways to prevent the disease in patients at risk were all mentioned.